(Located in central lower Michigan near the capital city of Lansing, MI.) Details below graphic. The HF beacon network is a joint effort of the International Amateur Radio Union and the Northern California DX Foundation. 18 locations around the world transmit alternately in precisely-timed 10-second time slots. The sequence of beacons repeats every 3 minutes 24/7/365. Each transmission consists of the callsign of the beacon in CW at 22 words per minute, followed by four one-second dashes. The callsign and the first dash are sent at 100 watts. The remaining dashes are sent at 10 watts, 1 watt and 100 milliwatts. The beacons are a quick way of assessing the ever-changing high-frequency radio propagation to various parts of the world, on different frequencies. If a given band is "open" to a particular part of the world, you will hear a beacon in that time slot. If the band is "dead", you won't. for details on how to interpret the BeaconSee display. This monitor installation uses a Yaesu FT-100 transceiver connected to a Cross-Country Wireless "Active HF Receive Antenna". This antenna (a miniature balanced dipole with an internal amplifier) has essentially the same vertical omnidirectional pattern and gain on all five bands. BeaconSee uses the CAT (computer aided tuning) interface on the FT-100 to automatically switch bands, so that all 5 bands can be monitored. Each rectangle in the display contains 8 narrow "slivers" that represent successive samples of the same band/beacon 15 minutes apart. 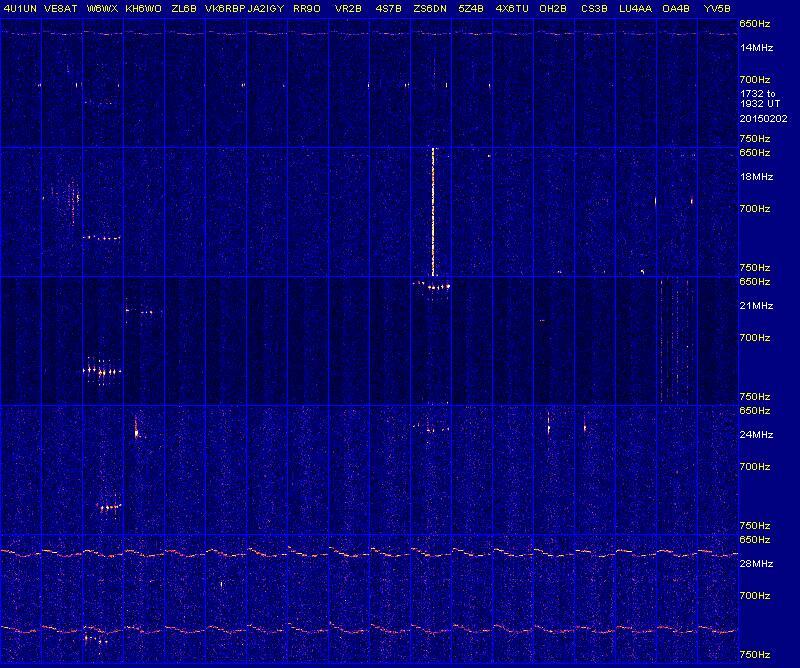 The entire display of eight successive 15-minute passes of all the beacons represents the past TWO HOURS of HF activity. The most recent transmission for each beacon is the right-most sliver in each box. Each box represents the past two hours for a single beacon. Background noise on HF frequencies increases when the frequency is open for long-range transmission. If the rectangles for a given band are solid blue, the band is completely closed. If grainy noise "speckles" show in the box, the band is open to somewhere, though possibly not to a given beacon location. If part of each box is solid blue and part is noisy, the band in question has opened (or closed) within the last two hours. Spots or streaks that show in multiple boxes side-by-side on the same band are not beacons. They are other transmissions, noise or interference that span more than one time slot. Actual beacons only occupy a single time slot in a single box. Actual beacons have a distinctive triangular shape when strong. They appear as a single dot when very weak; i.e. only the 100-watt part of the beacon shows.